The Malaysian financial system comprises a diversified range of institutions that serve the varied and complex needs of the domestic economy. The banking industry can be divided into the conventional financial and Islamic financial systems respectively. These two systems co-exist and operate in parallel. At the heart of Malaysian banking is Bank Negara – the central bank of Malaysia. This is the apex of the monetary and financial structure of the country. The principal objective of the bank is to promote monetary and financial stability that is conducive to the sustainable growth of the Malaysian economy. The banking system, comprising commercial banks, investment banks, and Islamic banks, is the main source of financing that supports economic activities in Malaysia. Banking institutions operate through a network of more than 2,000 branches across the country. Islamic finance in Malaysia continues to demonstrate dynamic growth with a comprehensive Islamic financial system that is supported by robust regulatory, legal and syariah governance frameworks. The Islamic financial system comprises four main components, namely Islamic banking, takaful and retakaful, (Islamic Insurance and re-insurance); Islamic interbank money market and Islamic capital market. 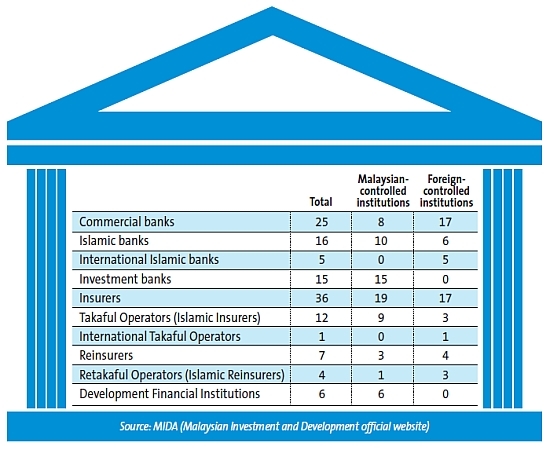 Islamic banks accounted for 24.2% or RM69.5bil of the country’s total banking assets as of end-July, up from 23.7% last year. Total assets grew at a faster rate of 20.6% between January and July, compared with 15.4% in the same period last year. The non-bank financial institutions such as development financial institutions and insurance companies exist in conjunction with banks to create platforms for savings. The insurance and reinsurance companies conduct life and general insurance businesses. The development financial institutions (DFIs) in Malaysia are specialised financial institutions established by the Government with a specific mandate to develop and promote key sectors that are considered to be of strategic importance to the overall socio-economic development objectives of the country. These strategic sectors include agriculture, SMEs, infrastructure, maritime and export-oriented sectors, as well as capital-intensive and high-technology industries. As specialised institutions, DFIs provide a range of specialised financial products and services to suit the needs of the targeted sectors. Ancillary services in the form of consultation and advisory services are also provided by DFIs to nurture and develop the identified sectors. DFIs, therefore, complement the banking institutions and act as a strategic conduit to bridge the gaps in the supply of financial products and services in the interest of long-term economic development. Now you have an understanding of the broader market structure. What about the jobs and opportunities in this market? Well, according to Allyhunt.com, a 29-year-old top investment banker with six years experience can earn a basic salary of up to RM180,000 per annum! This number was extracted from Robert Walters Global Salary Survey 2011. The best paying finance job is managerial-related, but if you’re at entry-level, the best-paying work is in the field of financial analysis or sales. However, the true money churners are the stock market traders or brokers that receive attractive commissions. If money is the driving force, well then that may be the choice for you. Many career choices in this market offer opportunities to individuals with different levels of skill. I started in a bank in South Africa as a teller, and progressed through the various administration sections, until I was promoted to a senior corporate banker many years later. For me, this was one of the most challenging and interesting jobs I have ever held. I had a portfolio of clients that ranged from telecoms to construction, importers, exporters, manufacturers, and property developers. Every day was different, and I had the opportunity to get to understand divergent industries and companies. I was fortunate that this position had enabled me to meet so many different kinds of people – some great characters and others that would remain etched in my memory for different reasons! The Malaysian banking market is currently developing at a rapid rate. Datuk Seri Nazir Razak, group chief executive of the CIMB Group sums it up well: “There are things that we can learn from Australia, there are things that we can learn from the West, things that we can learn from China, – we are very open.” . “Internally, we have a culture where we must learn from where there is a reservoir of knowledge,” he says. Into finance? Click here for more articles. I would like to inquire if you have any experiential learning programmes for corporate companies. We are in the midst of developing a training module for our employees and are looking to move away from the traditional, classroom-style training and do something more fun. Hope to hear from you and see if we can work together. Yes, we do have a range of experiential learning programmes that cover the topics you have listed. We have your email address, and will connect with you directly with more information.